My background is quite diverse: my first degree was in applied mathematics and physical sciences at the National Technical University of Athens, my Masters was in particle physics at Université Paris-Sud and my PhD in biomedical optics at Universidad de Murcia. 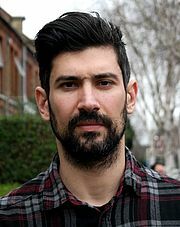 Additionally, I have conducted research in computational particle physics at the University of Cyprus and, currently, I am working as a Research Associate in visual neuroscience at University College London. I carried out my PhD at Pablo Artal's lab at the University of Murcia (https://lo.um.es/), as part of the Marie Curie network "Optical and Adaptational limits of vision". During my PhD I studied a phenomenon called intraocular scattering and the effect it has on vision and fundus imaging. Scattering is a microscopic phenomenon related to the wave nature of light. In general, it refers to the deviation of light off its trajectory due to particles or other localized non-uniformities in the medium. In physiological optics the term intraocular scattering refers to the elastic scattering of light when going through the eye's optical media and the ocular fundus. In the eye's optical media scattering is caused by a number of different structures in the cornea and the lens: fibres, protein molecules or even micro-scale changes in the refractive index between the collagen and the air in the cornea. In the ocular fundus the main structures responsible for the scattering (and absorption) of light are the melanin and the haemoglobin, located posterior to the photoreceptors in the Retinal Pigment Epithelium (RPE) and in the choroid. Scattering in the lens increases with age and it is the main cause of vision degradation in case of a cataract. The way scattering in the eye affects vision is very different from effects of other optical phenomena, such as aberrations (defocus, astigmatism, coma, etc. ): scattering creates a veil of light, originating from the brighter parts in the image and causing a loss of contrast. The effect depends on the optical quality of the eye's media but also on the characteristics of the image (mean luminance, dynamic range, and colour). Scattering affects the contrast of fundus images in a similar manner as in vision; light from the retina, after being illuminated by a flood source, travels through the eye's optical media and gets scattered before it is captured by the fundus camera. Simulations of the effect in vision and in imaging are shown below (fig. 1). Figure 1: Simulation of the effect of scattering in vision (top) and in fundus imaging (bottom) for different scattering levels. Notice how some details in the image can be missed due to the effect. The main focus of my work was a) to develop a method to quantify scattering objectively through an optical method and b) to develop an algorithm to compensate for the measured scattering in retinal imaging. One of the most fundamental quantities in optics is the Point Spread Function (PSF), which expresses the intensity distribution of a point source in the image space, or in other words, how much a point source extends on the retina after going through the eye's optics. The PSF is affected by scattering, diffraction at the pupil and aberrations. Due to the large scattering angles, the effect of scattering is observed over a very large spatial range in the PSF, whereas diffraction and aberrations cause a much more limited spreading of the PSF. Visually, scattering is perceived as a loss in contrast rather than an increase in blur as is the case with aberrations. The focus of my study was the wide-angle part of the PSF which was attributed solely to scattering. The main optical setup used for the study of scattering was the double-pass system. A double-pass system is a setup where structured light is projected on the retina (way in/first pass) and subsequently recorded by a sensor (way out/second pass), here an EMCCD camera. Appropriate use of optics separates the two optical paths and ensures that there is no contamination from back-scattered light from the cornea or the lens and that all light originates solely from the retina. A schematic of the system built for the study is shown below (fig. 2). The system could take in-vivo images of the fundus at various wavelengths, field sizes and eccentricities, fully controlled by a custom-made graphical user interface. Figure 2: The double pass optical system built for the study of light scattering in the eye. The first step of my research was a theoretical study of the spatial and spectral characteristics of scattering in ocular fundus and a comparison with scattering at the ocular media from experimental data. Although electromagnetism, in principle, could adequately explain light scattering, such an analytical description of scattering would be highly non-trivial due to the various structures responsible. Therefore, a more practical approach was taken where light propagation was modelled using Monte Carlo simulations and compared against in-vivo data from a set of subjects obtained through the double-pass setup. The simulations showed that a) scattering in the optical media exhibits a much larger angular distribution than scattering in the fundus, and b) the individual’s fundus melanin pigmentation (related to the colour of the iris) becomes significant for scattering only at longer wavelengths . 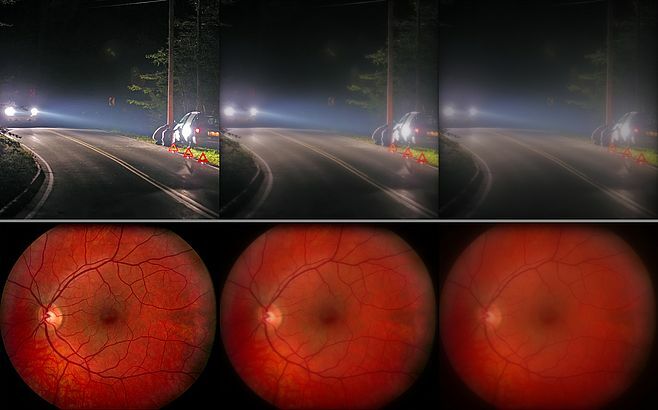 This last observation essentially meant that when shining red light at an individual’s eye, individuals with lighter eyes (blue, green) would have more light “circulating” in the eye than individuals with darker eyes (brown, black) due to the lack of melanin in the fundus. The same, however, was not true when shining green light. This led to the obvious question as to whether this excess red light is detected by our cones. In order to answer this question, the optical data for each individual were compared against the psychophysical data acquired using a custom built setup based on the Heterochromatic Flicker Photometry (HFP) method. The comparison has shown that the optically detected light is also visually detected . 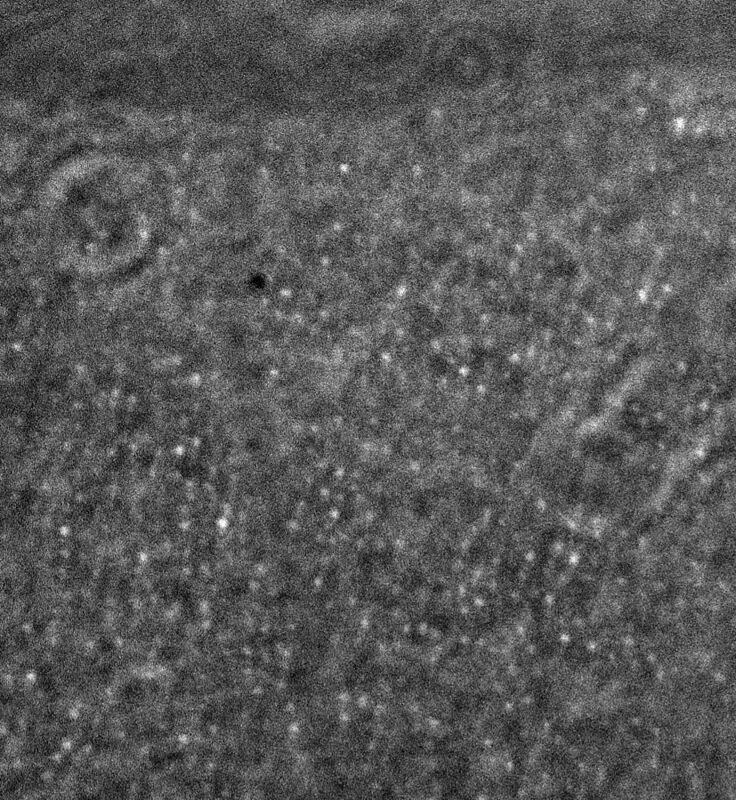 In the last part of my thesis, I focused on the effect of scattering in the optical media on fundus images. 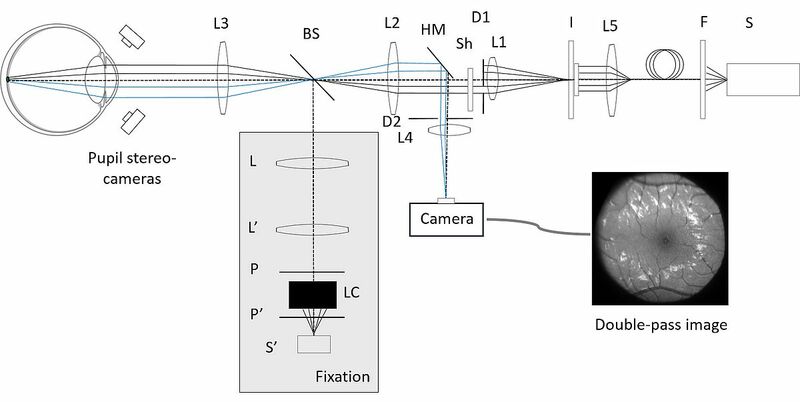 More specifically, we developed an optical method based on double-pass measurement for the reconstruction of the individual’s PSF and a deconvolution-based algorithm that could correct for the effect of scattering in fundus images. The method consisted of the projection of a series of uniform disks of increasing radius on the retina and their subsequent recording with a camera. The key observation for the reconstruction of the PSF was that the PSF is proportional to the derivative of the intensity at the centre of the uniform disk. Using the latter, the wide-angle pass PSF was reconstructed for the individual at a number of wavelengths. Subsequently, a fundus image was taken and the reconstructed PSF was used to compensate for the loss of contrast . Finally, the quantitative effect of scattering was tested in the measurement of the Macular Pigment Optical Density (MPOD) using the reflectometry method, which involves the capture and analysis of two foveal images at two different wavelengths. Not surprisingly, we observed an overestimation of the MPOD for our set of healthy, young subjects where the levels of intraocular scattering were relatively low . Finally, on the side, we developed a patent for a fast and accurate optical way to objectively measure the MPOD . The device was based on the double-pass principle and it was designed to use the least amount of optical components and a silicon photomultiplier tube instead of a sensor to minimize the cost. Currently, I am a post-doctoral research associate in Andrew Stockman's Colour Vision Research Laboratory at the Institute of Ophthalmology, University College London (http://www.cvrl.org), where I am building an Adaptive Optics visual simulator and imaging system for the study of human vision. The system, which is still under construction, will be able to deliver a near-diffraction limit, high-resolution dichromatic stimuli to the retina for vision research and is also capable of imaging individual cones at the periphery of the retina. In order to achieve near-diffraction stimuli on the retina, optical aberrations of the eye need to be corrected in real-time. The correction is done using a technology called adaptive optics, which was originally used in astronomy. The two principle elements of an adaptive optics system are the sensor and the corrector. The sensor measures the aberrations and the corrector corrects for them by changing its shape according to the information provided by the sensor. The sensor and the corrector function in a close loop configuration, correcting and measuring 30 times per second. The ultimate objective of the project is two-fold: first, to determine the human spatial contrast sensitivity function for chromatic and achromatic stimuli and second, to explore retinal function beyond the neural limit through the visible distortion of otherwise invisible high frequency stimuli. The optical system will be capable of fast, high-resolution imaging of the retina, an example of such image obtained with the system is seen below (fig. 3). Figure 3: Imaging individual cones with an AO flood illumination system. D. Christaras, H. Ginis, A. Pennos, and P. Artal, “Scattering contribution to the double-pass PSF using Monte Carlo simulations,” Ophthalmic Physiol. Opt., vol. In press, 2017. D. Christaras, H. Ginis, and P. Artal, “Spatial properties of fundus reflectance and red – green relative spectral sensitivity,” J. Opt. Soc. Am. A, vol. 32, no. 9, pp. 1723–1728, 2015. D. Christaras, H. Ginis, A. Pennos, and P. Artal, “Intraocular scattering compensation in retinal imaging,” Biomed. Opt. Express, vol. 7, no. 10, pp. 3996–4006, 2016. D. Christaras, H. Ginis, A. Pennos, and P. Artal, “Intraocular scattering compensation in macular pigment density measurement,” Invest. Ophthalmol. Vis. Sci., vol. 56, no. 7, p. 4119, 2015. P. Artal, A. Pennos, D. Christaras, and H. Ginis, “INSTRUMENTO ÓPTICO PARA LA MEDIDA DE LA DENSIDAD DEL PIGMENTO MACULAR EN EL OJO Y MÉTODO ASOCIADO,” P201630921, 2016.